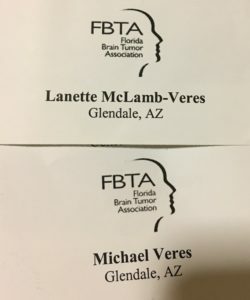 It was my honeymoon weekend that we attend our first brain tumor support group together. It was the 2001 Florida Brain Tumor Association conference. In 2000 I attended a BT conference in CA. It caused me to want more. At that event, I heard this GBM survivor named David M Bailey sing a song called One More Day and my life was changed. Who knew he would become one of my most cherished brain buddies. I met all these families that were experiencing the same journey. I was learning all this information and just had to share with Micheal and my family. WE WERE NOT ALONE. I did some checking and there was this weekend event in Florida called “Together in Hope”. We planned it as our honeymoon and our lives changed forever. I was hooked. I met my circle of friends that I didn’t know then but would learn they would be my first and lifelong BRAIN BUDDIES. This event would be where my idea to start Gray Matters was created. I attended every year until 2012 when they discounted the events. Sadly some of those friendships ended because of the disease but the commitment to the cause only grew stronger. Those of us still living are friends to the end. 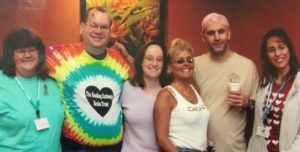 Even the caregivers who’ve lost their loved ones have remained a circle of strength. FBTA was where I met those who formed the first BT coalition. Many non-profits were created like Gray Matters. We went to DC. We built the BTAN Hats. We were a voice. The community grew. So many memories. 17 years I cherish all of it. I miss those days but they will never be forgotten.